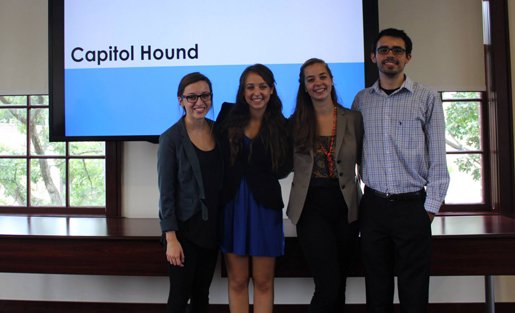 The initial Capitol Hound team. From left, Annie Daniel, Nikki Mandel, Lilly Knoepp, and Daniel Pshock. After gaveling in, praying and selecting new leadership, the North Carolina General Assembly came back into session Wednesday, January 14. Like our faithful lawmakers, the Capitol Hound folks took a break in the fall. We returned on Wednesday in much the same way the General Assembly did. Our lawmakers celebrated the births of grandchildren and honored friends who’d passed; at Capitol Hound we celebrated the addition of brand-new, shiny team members, but we’re also mourning the loss of the Center for Voter Education audio archive (more on that later). "The research and testing you do before launching a product is essential to ensuring its success. Likewise, your willingness to adapt and deviate from your original plan can make or break your product." With a new session of the General Assembly underway, it’s time to give you a thorough update on Capitol Hound. To refresh your memories: Capitol Hound is a service that combines a database of searchable transcripts of North Carolina General Assembly sessions with a keyword alert system. We’ve done a lot of work since the project’s inception: conducted a successful pilot launch, got a handful of paying subscribers, caught the interest of other states and, most recently, increased access to the service for North Carolina news organizations. But let’s take it back to the beginning for a moment. The original Capitol Hound logo from the summer of 2013. Way back in the summer of 2013, the question “How do we improve transparency in state government?” launched research on the little baby Capitol Hound. That summer saw in-depth testing of the desirability, viability and feasibility of the concept of transcribing General Assembly sessions and providing keyword alerts. Looking back on that initial research, many of the lessons still apply, but there’s also a lot that’s changed. As with any entrepreneurial project, you have to be ready to improvise at a moment’s notice. If you get too caught up in the way things were supposed to be, it’s impossible to fully enjoy (or find success in) the way things are now. So let’s take a comparative gaze at Capitol Hound. How were things supposed to go? And how has the project played out in real-time? The original marketing plan estimated that Capitol Hound would have 108 subscribers in the first year. For the 2014 so-called “short” session – when lawmakers met for a few months in the spring and summer – we had just eight subscribers. So was the desirability overestimated? Reading back through the marketing plan, it all makes sense. The summer 2013 team identified three large markets for the service: lobbyists, lawyers and news organizations. In those markets, they calculated that 30,000 people must stay informed of the actions and decisions made within the General Assembly. The Capitol Hound team for the 2014 short session. Josie Hollingsworth, Hrisanthi Kroi, and Samantha Harrington. The team talked with people working in each of those market segments and they received strong interest in the product. Yet it’s one thing to say that an idea is great, and it’s another thing to pay for it. So while desirability may have been high, the difficulty of sales was underestimated. Let me just say: Anyone who says that sales is easy hasn’t tried it. My direct involvement in Capitol Hound began May 1, 2014. It was two weeks before the short-session pilot launch kicked off, and we needed to sell. Because I’d worked in the Lab throughout the early evolution of Capitol Hound, I knew it was a great service and I expected subscribers to line up at our door. We were selling a service that makes people’s jobs easier, but we didn’t really know any of those people personally. Our basic sales approach consisted of printing out long lists of lobbyists and law firms and cold calling every entry. We left hundreds of voice mails and emails with a terrible response rate. In the end we learned a lesson that most salespeople probably already know: Cold calling isn’t particularly effective. In fact, the one market segment for which we did have warm contacts made up half of our subscriber total. So we’re taking these lessons and moving forward. As we make sales inquiries for subscribers, we’re focusing heavily on finding warm introductions. Additionally, our sales goal is more reasonable than the initial 108. As of this month, the General Assembly is meeting for its “long” session, which will likely last about eight months. We want 60 long-session subscribers. The sales issues carry over into this section. In the short session, the money we made from selling subscriptions did not come close to meeting costs. This, luckily, did not set us back because we received revenue that wasn’t predicted in the initial plan. This revenue came in the form of a grant from the Knight Foundation Prototype Fund. The initial business plan from the summer of 2013 predicted that revenue would surpass costs in Capitol Hound’s third year. We hope to sell enough subscriptions, 60, to meet the long sessions costs and beat the initial timeline. One important deviation from the initial plan is the cost of transcribing audio recordings of the General Assembly. Throughout the 2013 short session, Capitol Hound relied on a service called Mechanical Turk to create transcripts. The business plan estimated that this method would cost $24/hour. For the short session we spent $26/hour. But for the long session, we are no longer able to use Mechanical Turk. (It’s a long story.) After testing a variety of other transcription methods we have chosen another that costs $42/hour. In the midst of these changes we’ve tried to balance the cost of transcription with ensuring that our subscribers get quality transcripts for every session. In the long run, we believe that quality will make our service more profitable. Though costs increased, we hope Capitol Hound will be able to sustain itself in the near future. The feasibility section of the research saw the most obvious changes going into the long session. The House celebrated its 220th birthday session in the State Capitol, which isn’t hooked up to audio streaming equipment. The team hand-recorded the session. In many ways, the pilot launch went as originally planned. We used the transcription service suggested by the summer 2013 team. We also used the plan the team made for accessing audio. An organization called the Center for Voter Education recorded each live-streamed session of the North Carolina General Assembly and archived it on its website. We would pull the audio from those archives to run through the transcribing process. The long session won’t be that simple. I’ve already discussed our new transcription plan, but another challenge is that we can no longer obtain audio recordings of General Assembly sessions from the Center for Voter Education. Instead, now we record the live streams ourselves. We’ve discovered that by simply changing a few computer settings, downloading the free audio program Audacity, and plugging in a cord with an AUX jack on either end, you can record live streams. The essential lesson from this is that there are always multiple ways to do something. As long as you have an idea that’s desirable and viable, you’ll find a way to make it work. When your original plan falls apart, you can’t. Keep searching for new solutions. Better yet, have a backup plan before things go wrong. Last May, we tested alternate ways to capture audio even though the archive was up and running. That meant that when we lost the archive this time around, we were prepared to keep moving forward. May 2013 feels like a hundred years ago. Since that first brainstorm in summer 2013, Capitol Hound has undergone many transformations. But throughout all of those changes, the initial research has provided a solid foundation. The market research and user testing done that first summer is still valuable today. Capitol Hound proves that when a good idea is desirable and has the potential to be viable, anything is possible. But it also proves that even if a service is desirable, sales is REALLY hard. The research and testing you do before launching a product is essential to ensuring its success. Likewise, your willingness to adapt and deviate from your original plan can make or break your product. So to all you entrepreneurs out their grinding out your ideas: When you feel down, just remember that we’re down here with you. And we’re making it all work with an AUX cord, some chicken wire and a whole lot of duct tape. Samantha Harrington is a journalism and Arabic major at the University of North Carolina at Chapel Hill. She is reporter at Reese News Lab with STEMwire.org and can talk forever about global politics and digital media. This story originally appeared on Reese News Lab. Reese News Lab is an experimental news and research project based at the School of Journalism and Mass Communication at the University of North Carolina at Chapel Hill. The lab was established in 2010 with a gift from the estate of journalism school alum Reese Felts. The Lab develops and tests new ideas for the media industry in the form of a “pre-startup.” Teams of students research ideas for media products by answering three questions: Can it be done? Does anyone actually need this? Could it sustain itself financially? To answer these questions, students create prototypes, interview and survey potential customers, and develop business strategies for their products. Students document their recommendations on whether they believe a product will work and then present their ideas to the public.